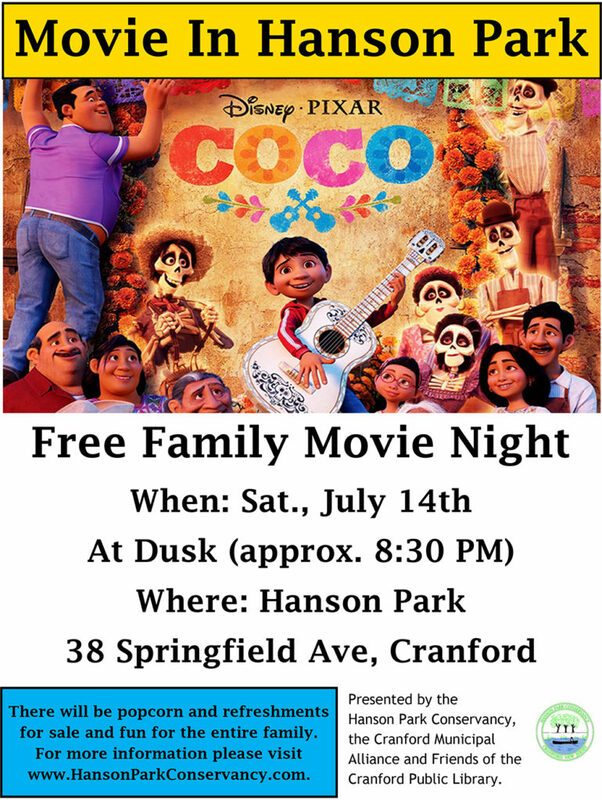 Bring your blankets and chairs and join us for a Movie in the Park on Saturday, July 14,2018 at Hanson Park, located at 38 Springfield Ave. in Cranford, New Jersey. The feature presentation will be Coco, a 2017 animated fantasy film produced by Pixar Animation Studios and released by Walt Disney Pictures. The story follows a 12-year-old boy named Miguel Rivera who is accidentally transported to the land of the dead, where he seeks the help of his deceased musician great-great-grandfather to return him to his family among the living.The film won two Academy Awards for Best Animated Feature and Best Original Song (“Remember Me”). This free family movie night will start at dusk (approximately 8:30 p.m.). There will be popcorn and refreshments for sale and fun for the entire family! Movie in the Park is presented by the Hanson Park Conservancy, the Cranford Municipal Alliance, and Friends of the Cranford Public Library.For more information please visit www.hansonparkconservancy.com.